Researchers report the first sighting in 30 years of a wild alligator snapping turtle in Illinois. The discovery may be a sign of hope for this state-endangered species, or the animal could be the last of its kind to have survived in Illinois without human intervention, the researchers say. The team reports the find in the journal Southeastern Naturalist. 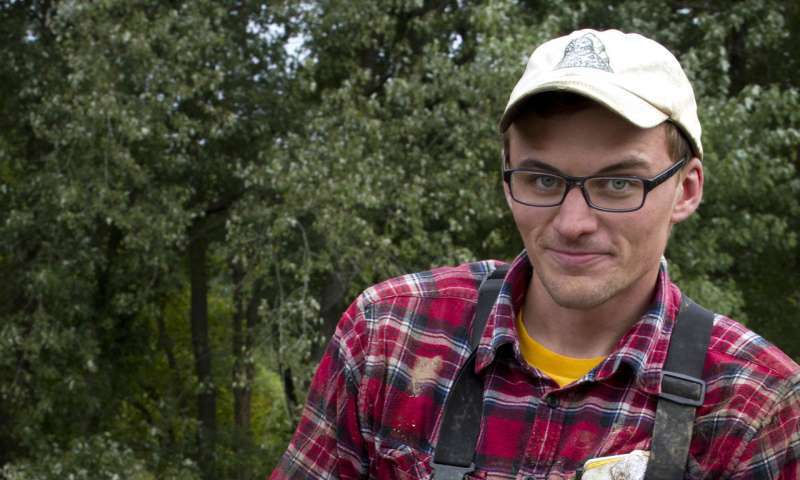 In October 2014, when Illinois Natural History Survey herpetologist Chris Phillips donned a wetsuit and dove to the bottom of Clear Creek in Union County, Illinois, he was looking for a young male alligator snapping turtle with a radio transmitter on its back. That turtle had recently been released in the area to bolster the state-endangered turtle population in southwest Illinois. "I was just about out of breath when I felt the turtle shell," Phillips said. "I thought I had found the male turtle I knew was there because I detected its radio signal. I felt along its back to where I thought the shell should end, but my hand just kept going." Phillips plucked from the water a 22-pound, 15-inch long female alligator snapping turtle that was twice as long as the one he was looking for, and at least 18 years old. Since she had no tracking device, she was not one of the turtles that had been released into the area. DNA tests showed that she belonged at the site and was not a lone traveler from a southern state. Southern Illinois is at the northern end of the turtle species' range. For years, INHS researchers have conducted extensive trapping, and have called for citizen observations along Clear Creek for signs of wild alligator snapping turtles, but to no avail. Populations of this state-endangered species have declined because of habitat changes including dams, drained swamps and river dredging. Only Union and Jackson counties offer the habitat that the turtles need to reproduce and thrive. Locating any wild turtles in these counties will help determine the next steps - whether to preserve a population or reintroduce more alligator snapping turtles in Illinois. "Bolstering a hidden population of an endangered species is better than starting a new population in the area," said Ethan Kessler, a graduate student of natural resources and environmental sciences at the University of Illinois and a co-author of the study. "However, since no wild alligator snapping turtles have been found in Illinois since 1984, reintroduction efforts make sense." For several years, researchers have purchased turtles reared in a facility and released them at ages 2, 3, 4, 5 or 6. They also released about 90 adult turtles. Most of the animals go into creeks with radio transmitters attached to their backs so they can be relocated and tracked. Researchers were conducting their biannual catch-and-release program when they found the wild turtle, close to the same spot and 30 years, almost to the day, after their last wild alligator snapping turtle was found. 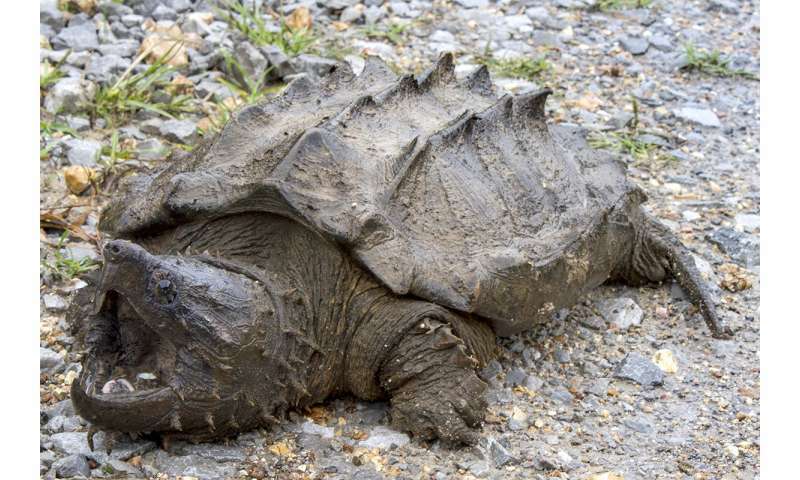 "Finding this individual does not indicate that there is a functional, stable population of wild alligator snapping turtles in Southern Illinois," Kessler said. "When a population dies out, a single turtle may wander around like a zombie waiting for the end of its days." Alligator snapping turtles can live 100 years, so the researchers working on this project today likely will not witness the advancing seasons of this female's life. After finding her, the team marked her shell with a notch and attached a radio transmitter to her back for tracking. The transmitter battery died, however, and finding her again in the sediment-filled depths of Clear Creek or elsewhere would be like finding a needle in a haystack, Phillips said. "She is marked, so in case of an incidental encounter, we will know it's her," he said. One of the challenges of tracking turtles that have been introduced in Illinois is that they disappear underwater and may not be seen again until divers retrieve them. "If we succeed with our project in introducing a new, viable population of alligator snapping turtles, it's likely that no one will see them," Phillips said. "It's not as if we're studying bald eagles that soar above us. I may never know the fate of these turtles, but it's cool to know that this wild space exists in Illinois." The alligator snapping turtle is listed as threatened in the U.S.